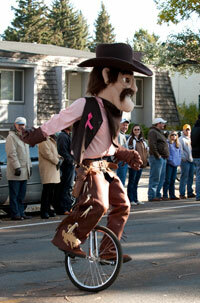 Pistol Pete will be among those marching in the 2009 Homecoming parade Saturday, Oct. 10. These are among the activities scheduled at the University of Wyoming from Monday, Oct. 5, to Sunday, Oct. 11. Monday, Oct. 5, 6 p.m. -- Montana sculptor Nick Lamb will demonstrate netsuke carving at the UW Art Museum. Tuesday, Oct. 6, 11:30 a.m.-1 p.m. -- Homecoming pig roast in Simpson Plaza. Tuesday, Oct. 6, 4 p.m. -- Former president of Ecuador Jamil Mahuad will discuss "The Rise of the New Left in Latin America" in Room 129 of the UW Classroom Building. The event is free and open to the public. Tuesday, Oct. 6, 7 p.m. -- The UW Outdoor Program will present a free screening of the new movie, "The Freeheel Life," in Room 129 of the Classroom Building. Wednesday, Oct. 7, 7 p.m. -- Mountaineer Raymond Jacquot will give a free presentation about the history of American mountaineering, Room 214 of the Classroom Building. Thursday, Oct. 8, 4 p.m. -- Professor Alan Nadel, will discuss "Revenge as a Faith-Based Initiative or 'What's That Snake Doing in Mel Gibson's Kilt?'" as part of the English department's L.L. Smith/MA Speaker's Series, Room 302 of the Classroom Building. Thursday, Oct. 8, 6 p.m. -- The annual Iron Skull Homecoming Sing takes place in the College of Arts and Sciences auditorium. Thursday, Oct. 8, 7:30 p.m. -- The UW Symphony Orchestra opens its 2009-10 season with a performance featuring trumpet soloist Scott Meredith in the Fine Arts Center Concert Hall. Tickets cost $10 for adults, $7 for senior citizens and $6 for students. Thursday, Oct. 8, 8:30 p.m. -- A Homecoming dance open to students and the public will be in the Wyoming Union ballroom. Live music, activities and free food and drink will be provided. Friday, Oct. 9, 2:30 p.m. -- The annual Keith and Thyra Thomson Honors Convocation with journalist Dan Haley as the keynote speaker, College of Arts and Sciences auditorium. Friday, Oct. 9, 3:30 p.m. -- Lawrence C. Novak of the Portland Cement Association will deliver the annual H.T. Person Lecture in Engineering and Applied Science in Room 1045 of the College of Engineering building. The lecture will focus on sustainability of buildings and the design of the Burj Dubai, the world's tallest building. Friday, Oct. 9, 7:30 p.m. -- Happy Jacks send-off to China performance in the Fine Arts Center Concert Hall. Saturday, Oct. 10, 9:30 a.m. -- Homecoming Parade starts at 9th and Ivinson streets, featuring a number of floats from various campus and community organizations. Saturday, Oct. 10, 7:30 p.m. -- The Faculty Recital Series continues with John Fadial on violin, and Rubia Santos on piano, Fine Arts Center Concert Hall. Tickets cost $7 for adults and $5 for students and seniors.